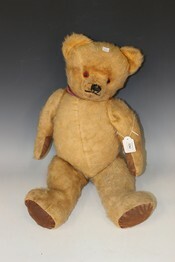 A mid-20th Century mohair hump back teddy bear with amber and black eyes, stitched snout and jointed body, height approx 38cm, together with a Jopi musical teddy bear and another teddy bear. 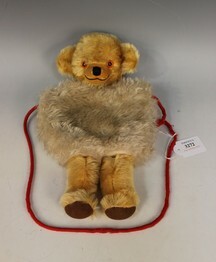 A Merrythought Cheeky child's hand muff with a bell in each ear, amber and black eyes and stitched snout, height approx 35cm. A mid-20th Century soft toy rabbit with boot button eyes and stitched snout, wearing a blue felt jacket with a carrot in its pocket, height approx 29cm, together with a collection of Continental dolls, Oriental figures, etc. 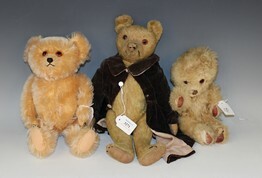 A Steiff golden mohair growler hump back teddy bear with amber and black eyes, vertically stitched snout and claws, and jointed body with fabric pads, height approx 60cm (lacking button, nose stitching damaged, some bald patches, stuffing in left arm weak). 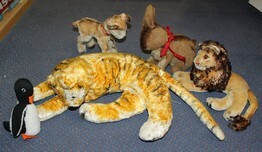 A Merrythought soft toy rabbit, seven other soft toys and a celluloid doll (faults and playwear). 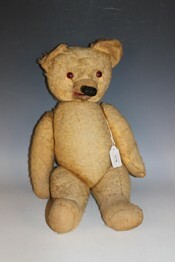 A mid-20th Century mohair teddy bear with amber and black eyes, stitched snout, working mouth and jointed body with fabric pads, height approx 51cm (playwear and bald patches). 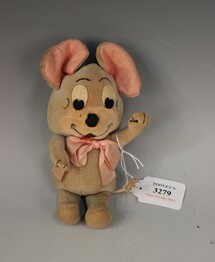 A Merrythought Jerry mouse, height approx 17cm (some fading). 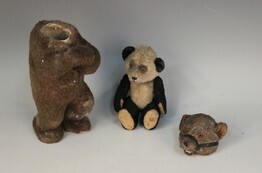 A mid-20th Century panda bear with amber and black eyes, stitched snout and jointed body, height approx 14.5cm, and a soft toy model of a brown bear, height approx 20cm. 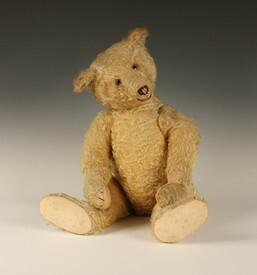 A Steiff mohair teddy bear with boot button eyes, stitched and shaven snout, and jointed body with fabric pads and stitched claws, height approx 36cm (playwear, bald patches, repairs and weak stuffing in the arms and legs). 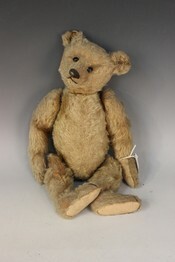 A mid-20th Century mohair teddy bear, with amber and black eyes and stitched snout, the jointed body with rexine pads, height approx 66cm (faults and bald patches).